The newest book in the Pond Boss How-to-Series. 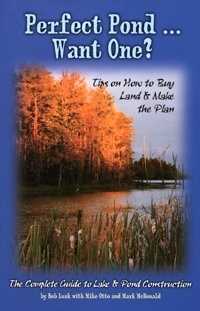 From thought to finish this book offers wise counsel, how to shop for land, pick the best pond site and hire contractors. Laced with 1 stories stirred amongst sage advice, this is the "go to" book on pond construction. ORDER TODAY! (price includes shipping and handling).